My backyard has been filled with birds the past few weeks and with the coming deep freeze – Chicago is getting a blast of subzero arctic air tomorrow – my feeders will be even busier. Temperatures are expected to plunge ten to fifteen degrees below zero F (about -25C) and stay there for a few days. Brrrrr! One of the ways birds stay warm is by burning calories to generate heat. They fluff up their down feathers to trap body heat. Their outer feathers have an oily coating for insulation. That’s the quick answer. Some birds, like Chickadees, can slow their metabolism while they sleep to conserve energy, some huddle together to share warmth, others take shelter in shrubs, tree cavities or bird houses. There’s a lot more science behind it but if they can’t find food, water and shelter they will not survive. I leave my nest boxes, or bird houses, out all winter and provide a roost box that will house multiple birds. 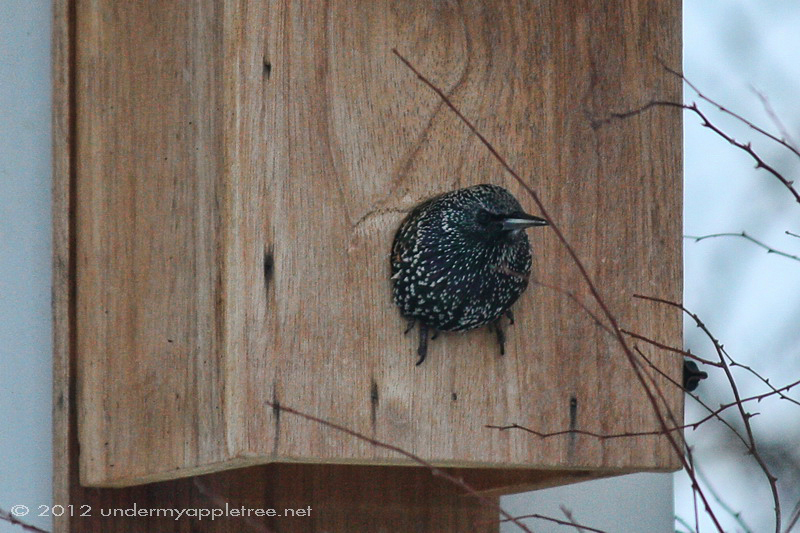 Several years ago a European Starling claimed the box and hung out in my yard every day, guarding it all winter. I swear the same bird brought his family to my yard the following the summer and introduced his youngsters to the feeders. 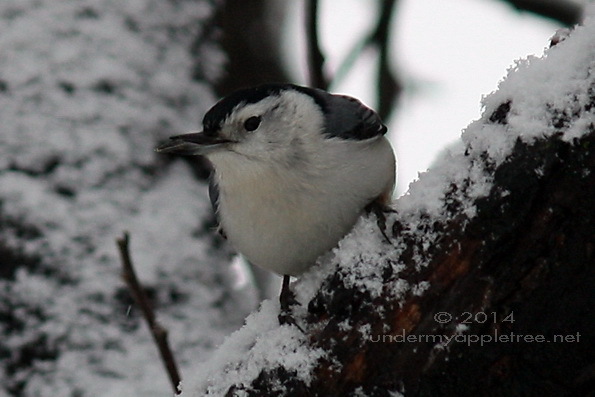 I watched this little White-breasted Nuthatch go back and forth to the sunflower feeder taking one seed at a time and stashing it in a crevice in the bark of the apple tree. I hope he can remember where he puts them. 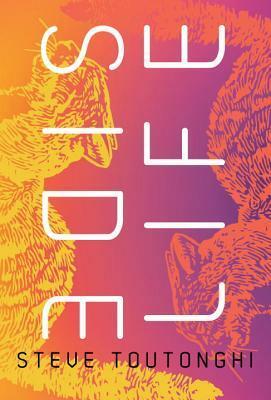 When birds burn additional amounts of energy to stay warm it severely drains their fat supplies. Long cold spells can be disastrous if they can’t find high fat foods. This week’s 12 to 18 inches (30-45 cm) of snow across the central and eastern US is making that difficult for many of them. 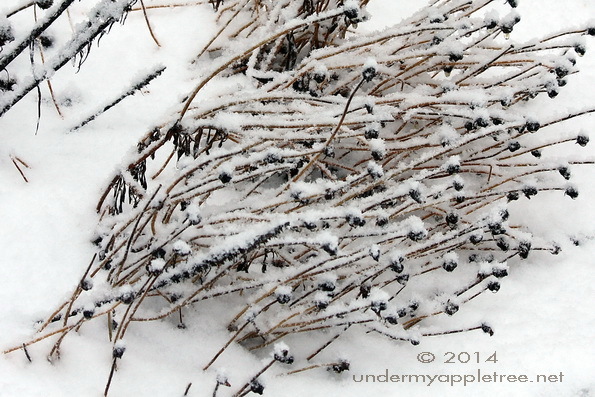 I leave native plants uncut in the garden until spring so the birds can eat from the seed heads. Flowers such as Coreopsis, Black-eyed Susan and Cone Flower all provide food. That’s my garden on the right. I’m not sure what plant that is under all the snow. In better weather the birds would be hopping on the ground picking up the fallen seeds or sitting on the plants, but the snow makes it challenging. Birds spend about five or six hours a day searching for food. That too burns up a lot of energy. Some will survive, some won’t. High fat foods provided in a feeder make it much easier for the birds looking for a meal when seed and fruit producing plants or insects are unavailable. So yes, I would say providing food is beneficial and helps the bird population. High fat foods such as suet and sunflower seeds are favorites and provide a lot of energy. Looking out the window this morning I see about 40 birds in my yard roosting in shrubs and trees and eating at the feeders. There’s a lot of snow on the ground but the temperature has risen to about one degree below freezing. They seem to know even more severe weather is coming and are eating as much as they can. I have six bird feeders in my yard and have tried many others. I’ll be writing a post on my experience with the different feeders: What works, what doesn’t and the big question, how to co-exist with the squirrels. Your bird feeders are really helping out the poor, lovely winged creatures. Your photography is phenomenal. The birds will be sooo grateful if you do! I am making my third batch tomorrow. They are just devouring it and I suspect they are telling their friends about it too. We use feeders too but only have a couple, I like to give the poor things food as well the weather is getting very cold. Good for you! I like your second pic especially, but they’re all nice. And yes the squirrels have been frustrating to us! Thanks. After I took that shot I noticed he still had a sunflower seed in his beak. The birds need us so much! I have several feeders that I keep filled and have hung suet logs logs, too. The squirrels are a problem, and the only way I’ve found to keep them away from the feeders is 1) two of my feeders are “Squirrel Busters” and 2) I throw out shelled peanuts to keep the squirrels busy and away from my feeders. I can deter them most of the time but occasionally I get that one psycho squirrel that will do anything to get up there. I’m sure your yard is a haven for the birds during those frigid temperatures. We’re going to have cold weather but nothing like what you’re expecting. -15F is the predicted high temp for Monday, with wind chill -50F. I’m starting to check my sanity living here, this is insane. As I’ve said before, if I had wings I’d keep going much further south for my winter migration! No, you’re right, birds eat berries all on their own. Draping some netting over the berries should help but you may get a few birds caught inside. I put bunny wire around my garden to keep the rabbits out and ended up with a trapped baby bunny. Some people only put feeders out in the winter. Many of the birds in my yard now are short distance migrants and therefore not the same birds that would be eating my apples, etc in the summer. So winter feeders only could be a solution for you. Such a great post as always Leslie, so very informative. Your weather in North America is crazy at the moment, glad you’re there helping to take care of the birds. 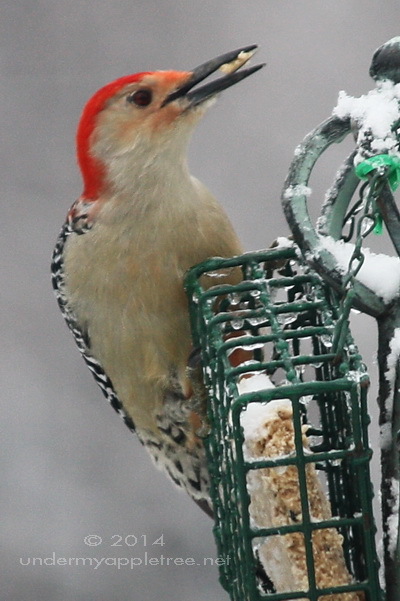 I always love your woodpecker photos. I’ve been wanting to make a few bird feeders but haven’t yet. I can’t wait for your posts about which bird feeders are the best. It’s so sad to think some birds won’t make it through the winter. 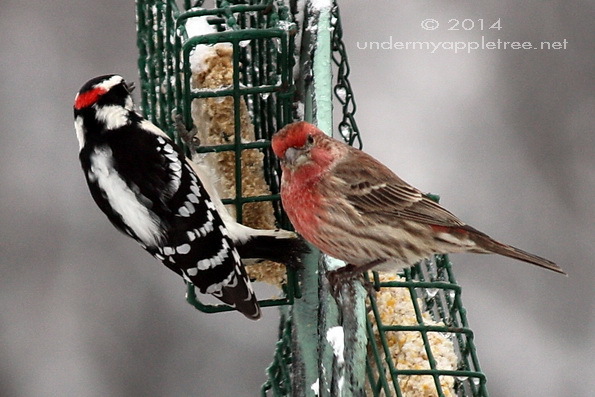 Our bird feeders have been so crowded for the past several days …. the suet cake we put out two days ago is well nibbled at this point too! Amazing how much they need to eat to keep warm during these cold snaps! Great photographs! Thanks for sharing!! Have a great 2014! Leslie, your photos are as gorgeous as ever! My in-laws used to feed numerous mountain birds and I always thought it was wonderful. Here, I set out peanuts for the jays once in a while. 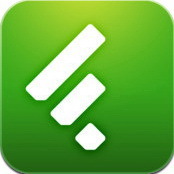 Terrific post! Love your photos. We don’t have bird feeders for the same reason we don’t have pets — a desire to travel and an inability to be consistent in chores like filling feeders. But I sure see the attraction in your photos! For about 5 years I feed a squirrel instead of birds. My feeder started as a bird feeder but a squirrel kept coming. Eventually we adopted her. She finally passed away last year and I sure do miss her. She would just hang out on my deck with my cats. Love the pictures! Five years is good for a squirrel. Well, it is in Chicago with our nasty winters. I have a walnut tree in my yard so I always have squirrels but I feed them too and they mostly leave the feeders alone. Only once did I have an insatiable squirrel that would do anything, and I mean anything, to get up to a feeder. She could jump straight up to the edge and with enough attempts would get in. She hung out in my yard for two years and one day just stopped coming by.